Upon entering Las Casas, I felt like I was being transported back to the past. Old houses greeted our sights as guards and usherettes in full uniform welcomed us. A picture with the staff in full old traditional uniform. Las Casas Filipinas de Acuzar is a musuem/resort that boasts of houses and mansions from the 18th to the 20th century Philippines. The owner, Mr. Acuzar has a penchant for old house and he has been going all over the country in search for the old marvels. In total there are 27 heritage architectures, each house has its own story and history. For an entrance fee of Php 600, you'll get to be toured around the vicinity. The tour guide told us that these reconstructed houses contained twenty to sixty percent of the original materials that came from the actual house. Whenever Mr. Acuzar spots an old house that he likes, he'll buy the house from the said owner. They carefully tear the house down piece by piece then transport the pieces back to Las Casas. The said pieces were used to rebuild the house in its original form. What's so nice about this place is that you can actually rent a whole fully furnished Casa and stay for a night or two. Inside you'll be able to re-live the old times as the furnitures and fixtures are replicas from the past. The Casa below is now under construction to be built into a hotel in the future. The tour also includes a peek inside some of the houses. Everything was sophisticatedly done to make you feel that you're living in the past. From the ceilings, chandeliers, walls, paintings, mirrors and furnitures, everything was a marvel to behold. This house had a 'stop-over' area for ladies who were wearing big and heavy gowns to take a short rest before heading up to the living area. I was amazed on how intricate the carvings were on the table. A huge hall with baroque style columns. Beautiful Mirrors hanging on the walls. Replica Paintings of Fernando Amorsolo. A reproduction of an old living room. There were also different sculptures standing around the grounds depicting children playing traditional Filipino games. There was also a mini-museum housing different antique collectibles. Facilities include a kid's swimming pool resembling a batis (spring) , a beach, a river for boat riding and fishing. 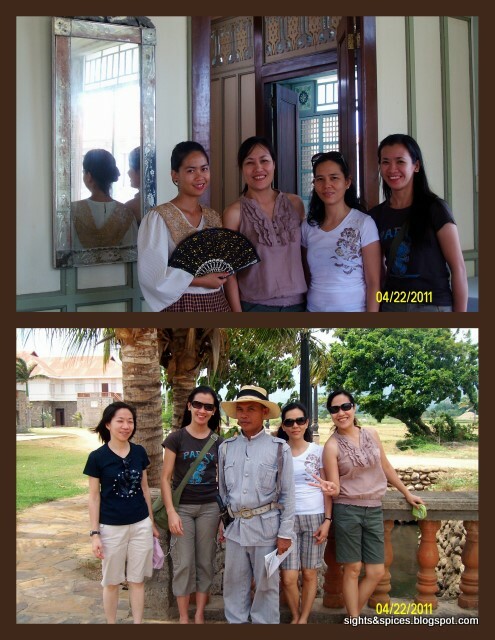 Las Casas Filipinas de Acuzar is an awesome place to behold and experience. I was at awe on the attention given to every small detail in building the resort. Its definitely a blast from the past! may cellphone number po ba kayo na pwedeng twgn para makapginquire about fieldtrip?